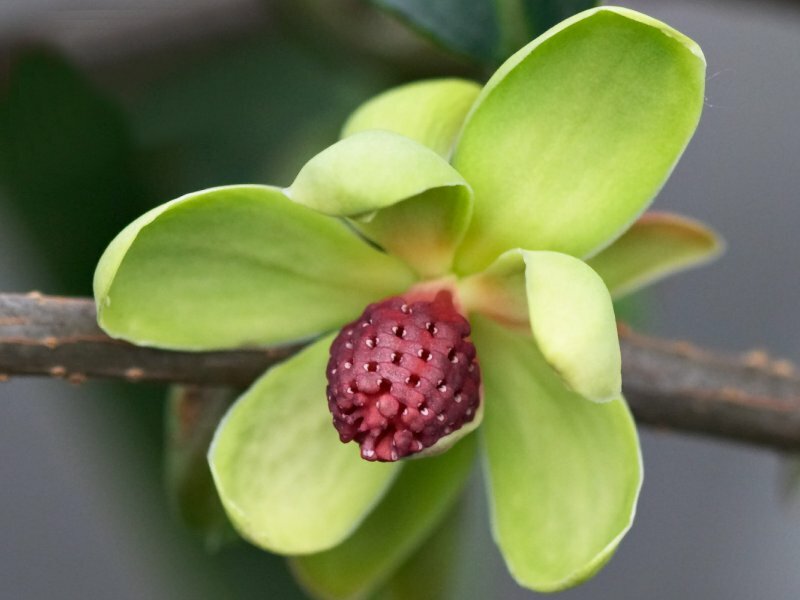 With the possible exception of Kadsura japonica (magnolia vine), Kadsura is poorly known in cultivation. Evergreen twining lianas (woody climbers), they are closely related to Schisandra, a genus of mostly deciduous vining species from Asia (one species in the SE USA). Both genera produce unisexual flowers, usually on different plants, with the females exhibiting separate carpels spirally arranged on a conical torus (floral axis). Once fertilized, each carpel expands to become a spherical berry and the torus expands, elongating into a spike in Schisandra or becoming globose as in Kadsura. Kadsuras are strictly Asian and Kadsura interior is known only from SW Yunnan and NE Myanmar (Burma). This species differs from the related Kadsura heteroclita (Roxburgh) Craib by its softball-sized fruits covered with up to 70 glossy, red berries (Kadsura heteroclita produces smaller walnut-sized fruits with fewer berries). We have only the one plant, derived from seed collected by Peter Wharton (curator of the David C. Lam Asian Garden [in 2005]) from a venerable 25m specimen growing at 2200m on Qiqi Mountain, Gongshan County, Yunnan. Although this species is monoecious (both male and female flowers are produced on the same plant), production of its extraordinary fruits is not assured as pollen may be released when stigmas are not receptive. Dichogamy (the maturation of male and female organs at different times, thus effectively preventing self-polination) is a common feature in monoecious plants. In protandrous plants (anther release prior to stigma receptiveness), sufficient pollen can be collected and stored until pollination can be effected; however, this species appears to be protogynous (our first flowers are clearly female). “Daniel, you should go photograph the Kadsura“. “Hey, did you know the Kadsura is in bloom?”. Phone call: “You should come take a photo of the Kadsura“. I’m going to embarrass myself nowiiI didn’t know what the big deal was. Why was everyone telling me to go take a photograph? Fire up Google. Search for “Kadsura interior”. Ah. It is a big deal. A very big deal. The researchers and staff at UBC are in a select group of hundreds, if not dozens, of North Americans and Europeans who have ever seen Kadsura interior in person. Viewing this photograph makes you part of a similarly-sized small group – as far as I can tell, no images existed of this plant species online until now. Unfortunately, because we have only the one specimen, I’m going to assume we’ll need to successfully propagate it before making it available for the public to see – so the photograph will have to suffice for now! Researchers from the Department of Pharmacognosy, Shanghai Medical University, People’s Republic of China have screened Kadsura interior for medically active compounds. Using bioactivity to select fractions of an alcoholic extract of Kadsura interior stems, they isolated twelve lignans, seven of which showed anti-HIV activity. Gomisin-G is the most promising. Anti-AIDS agents–XXVI. Structure-activity correlations of gomisin-G-related anti-HIV lignans from Kadsura interior and of related synthetic analogues. Bioorg Med Chem. 5: 1715-23. I’ve just made the pleasant discovery of your Botany Photo of the Day(I was looking for information about Piet Oudolf’s talk in Vancouver on July 18th)! I am a member of the North Shore Photographic Society, and will be glad to tell my fellow photographers about this feature on your website. I’m sure it will provide intrigue and incentive to our members, and perhaps result in more paying visitors to your collection. Hi Kim! If you haven’t found it already, you can get that information on the web page for the Vancouver Hardy Plant Group. I’ll have similar information up on this site sometime this month, though. Thanks for telling people at the North Shore Photographic Society. If this site does provide incentive to other photographers, I hope one of the messages is “Keep taking pictures. You improve by practicing.” (and one can quite easily see how my photographs have improved over the past couple years with a little digging around the garden web site). I should also mention that a huge part of my inspiration comes from two local photographers: June West (who is one of the UBC Friends of the Garden) and Fred Chapman. Fred shared an afternoon with me a few months ago – his photographs made my heart sing.